I have seen quite a few sport stadiums and arenas in my lifetime but none that have inspired within me the awe of Wembley. The walk up "Olympic Way", the warm welcome of the Bobby Moore statue and the magnificence of the giant supporting arch - the "Home of Football" makes its visual mark before you have even stepped through its doors. This is why people come to Wembley, the place where sporting lives change and clubs make history on the hallowed turf. So surely a preseason "Wembley Cup" - featuring European champions Barcelona, African club of the century Al Ahly and British big-hitters Celtic and Tottenham Hotspur - would be a tournament not to miss. I mean it is Wembley, the Mecca of football in England, how could the masses not respond? Once inside, I was struck with a sea of bright red. From left to right, an ocean of empty seats, reaching from the ground to the heavens and all I could think of was just how many people were needed to fill this place? The simple answer is 90,000. It might not be the biggest, but as the 21st biggest stadium in the world it is still up there with the best. To understand just how big consider a little comparison: Rome's Colosseum had a capacity of 4,296, consequently; it would therefore take 21 gladiatorial events to match the attendance of one England home game. Large? Yes. But too big for Barcelona? Surely not. Seeing the Spanish giants live for the first time since being crowned 2009 European and La Liga Champions, the expectation was for crowds to flock in their thousands to catch a glimpse of Lionel Messi and Thierry Henry. But to my astonishment the match was played in front of barely 20,000. Crowds increased to about 40,000 when Celtic and Tottenham hit the pitch, but still the place looked cavernous. So why lack of enthusiasm? Maybe the reason could have been ticket prices, where a one-day pass would cost between $48 and $97 for an adult. The credit crunch is still an issue for many and with the ticket price, plus travel, food and merchandise; an expensive day could have proved a bank-breaker. The other reason could be that because it was a Sunday, people would rather just stay at home and relax by watching the game on television before another hectic week at work begins. Whatever the excuse, one thing is for sure the Wembley experience, engraved in my mind until the end of my days, cannot be experienced from the couch and the marketing department's dream of a packed-to-the-rafters stadium did not materialize. Consequently, Barcelona trounced Al Ahly and Celtic were victorious over Harry Redknapp's Tottenham Hotspur, in another chapter of the age-old conflict between the English and the Scots, in front of a disappointing crowd. Despite the lack of numbers, the cheers from fans filled the air within the cauldron of the stadium. 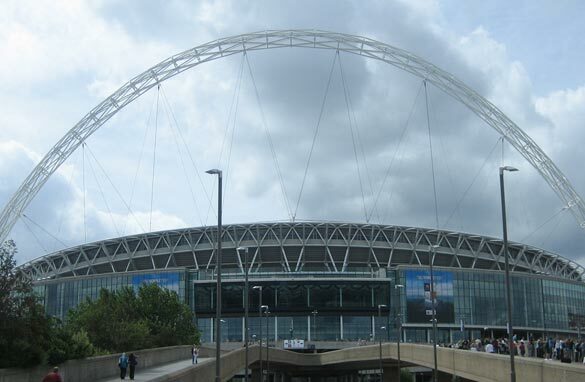 Celtic will go down in the history books as the 2009 winners, but the tournament may have to think of a re-brand; Wembley Cup might be better named Wembley "no show up." Just a thought.